Since our Great Rides Bikeshare record breaking launch in 2015 (awarded nations most rides per bike per day three years running) we’ve met with the leaders of Bikeshare around the country at B-Cycle World and received inquiries and had discussions with cities and Universities over the years. We’ve been open and eager to share our innovative student led, easy access model. Cool to see Austin TX is another system we’ve worked with that has adopted our model to help reduce campus congestion and add value and their ridership is exploding! So fun to see our student led, innovative Great Rides Bikeshare model that took us from 2011 – 2014 to develop, gain student support along with strong community sponsors is now helping lead the nations bikeshares toward easier to use and more robust systems. We’ve been delivering on the demand for sharing economy solutions to reduce transportation costs and congestion and having a positive national impact. Let’s keep making it a Great Ride! Campus bike sharing in the United States seems to have hit a new high water mark on the flagship campus of the University of Texas. Forty days after launching a free pilot program for UT students with 85 new bikes to serve them, Austin B-Cycle says it’s on track to more than double the ridership of its entire 530-bike system. Austin Active Transportation Program Manager Laura Dierenfield said 7,800 students have registered for the program so far — 15 percent of the UT campus’s entire student body. Students aren’t just signing up for the free program, either. They’re biking. In the program’s first 40 days, the campus bike docks averaged 12 checkouts per bike per day. For comparison’s sake, the average New York Citi Bike is ridden five to six times per day during the spring. UT’s rapid embrace of bike sharing already puts the campus in striking distance of ridership at maybe the nation’s most successful university-linked bike share system, at North Dakota State University in Fargo, N.D. During that system’s season, its 100 bikes average 13 checkouts per day. “An overlooked example of an integrated payment system already exists—in Fargo, North Dakota. And it’s created arguably one of the most successful bike share systems in the country. Ride ON! Great to see our innovative Matbus inspired, student led model for Great Rides Bike Share making such a positive national impression. It took us about 3.5 years to get our one of a kind bike share model going, but thanks to patience, tons of homework, making the case that our unique business model for bike share can flourish here is paying off. over 40 rides an hour in the 16 hour daily operating period. Many in the bike share world are anxiously awaiting the launch of Los Angeles’ system this summer because of its ambitious transit integration plan: You’ll be able to check out a bike with the same card that gets you on a bus. But an overlooked example of an integrated payment system already exists—in Fargo, North Dakota. And it’s created arguably one of the most successful bike share systems in the country. Fargo’s Great Rides is an 11-station, 100-bicycle seasonal system. Its last season saw 143,000 trips and an average of six or seven rides per bike per day—more usage per bike than in New York, Washington DC or Paris. Their primary user base: the students at North Dakota State University. Students there take approximately 90 percent of bike share trips. It’s a model that transit, housing and social service agencies everywhere should be watching closely. Not to mention other schools. A Great Rides seasonal pass is included as part of the mandatory student activities fee at NDSU. All students have to do to activate their membership is log on to the website they already use for their academic courses and university-related tasks and agree to Great Rides’ terms of service contract. Then, they can instantly check out bikes using the student ids they are already use to carrying with them. It turns out that when you snap bike sharing into an existing system that already has a financial relationship with users and all the tools they need—and no additional sign-up cost—the results can be spectacular. NDSU has a student population of approximately 15,000—8,000 of them have registered with Great Rides, and of those, 6,000 took at least one trip during the eight-month season. The sponsorship relationship between Great Rides and NDSU is similar to a preexisting program between the university and the local bus system that allowed students to use their school IDs to access the bus system. Students already knew about that and are using public transit to great effect, so expanding the concept to bike share was easy. Great Rides’ popularity recalls the massively successful bike share system in Hangzhou, China, one of the world’s largest. Its users can check out one of its more than 60,000 bikes using their transit cards and get an automatic discount when they do. Curry doesn’t see Great Rides pickup numbers as an anomaly among the bike share industry. She believes systems just need to integrate as intimately as possible. “It was a lot of IT work and a lot of work with the university to set everything up,” says Curry, before adding that the payoff was worth it. On their end, NDSU has included photos of bike share in their recruiting materials for potential students, and their facilities department has reported adding additional bicycle racks to accommodate the growing number of personal bicycles on campus. The university has also begun incorporating questions about bike share into their annual survey about transportation. “It’ll be interesting to see if we move the needle,” says Curry. Great Rides is considering expanding to service other universities in the area, but Curry notes that progress toward that goal is deliberate and not rushed. One reason the relationship with NDSU has worked so well is that student government and administration were involved and excited from the system’s inception. The Better Bike Share Partnership is a JPB Foundation-funded collaboration between the City of Philadelphia, the Bicycle Coalition of Greater Philadelphia, the National Association of City Transportation Officials (NACTO) and thePeopleForBikes Foundation to build equitable and replicable bike share systems. Doors open at 9:30, free admission and lunch as we learn to bike safely and share the road. Pedal over and check out Fargo/Moorheads first ever Bicycle Summit Saturday at Fargo South High School to learn why biking is one of America’s fastest growing activities. September 12: Don’t miss the 1st annual Valley Bicycle Summit, a day full of opportunities for families and individuals to learn more about taking bicycling skills to the next level. The event will be held Saturday, September 15, from 9:30 a.m. – 3:30 p.m. at Fargo South High School, 1801 15th Ave. S. Come for all or part of the day for sessions on how to safely get around town by bicycle, whether with your kids or if you want to commute to work. Don’t bike? Hear from local riders on how automobile drivers and bicyclists should interact with each other on the road. The event is completely free, and will include lunch for all participants. Bringing a bike is optional, but encouraged. View a complete schedule of events online at www.sharetheroadfargo. Watch a short video about the summit. The day begins at 9:30 a.m. with a presentation from Dorian Grilley, Executive Director of Bike MN, Minnesota’s statewide bicycle advocacy organization, and will end with group rides for families and advanced riders. View a complete event schedule . Throughout the day we will have a semi-truck available for participants to get in the driver’s seat and experience the blind spots that all bicyclists and drivers should be aware of. MATBUS will also have a bus available to practice loading and unloading your bike from the front rack. Vendors from local businesses will be on hand to help you and your family transition to confident bicyclists. We are excited to have experts on cycling from around to region on hand to answer any questions you have. Planning on coming to this free event? Please let us know by registering ! A special thank you to Active in Moorhead for sponsoring our event. Check out “Bike Share Lunch and Learn” 11:30 Wednesday at the Fargo Theatre introduced by Doug Burgum and presented by NDSU student leaders Cameron Knutson, Aaron Feickert, Robbie Lauf, Walter Lanza, and myself. Thanks to the Kilbourne Group for sponsoring and Greg Tehven for making all the arrangements. Fargo is fast becoming a more active community with over 20,000 involved in the Fargo Marathon and over 10,000 involved in this years “Streets Alive” events. This is a follow up in bike share interests and the well received B-cycle demonstration here at last years event. Fargo is also in the top three cities with over 228,000 clicks has Fargo in 3rd place in B-cycles “Who wants it more” B-cycle national contest. “On behalf of Downtown Community Partnership, Kilbourne Group, and Mike Williams, I’d like to invite you to join us in learning about the potential of a bike share program in our community. History: The exploration of Fargo Bike Share began working alongside Student Government leaders at NDSU throughout the fall, spring and summer months of 2011-2012. 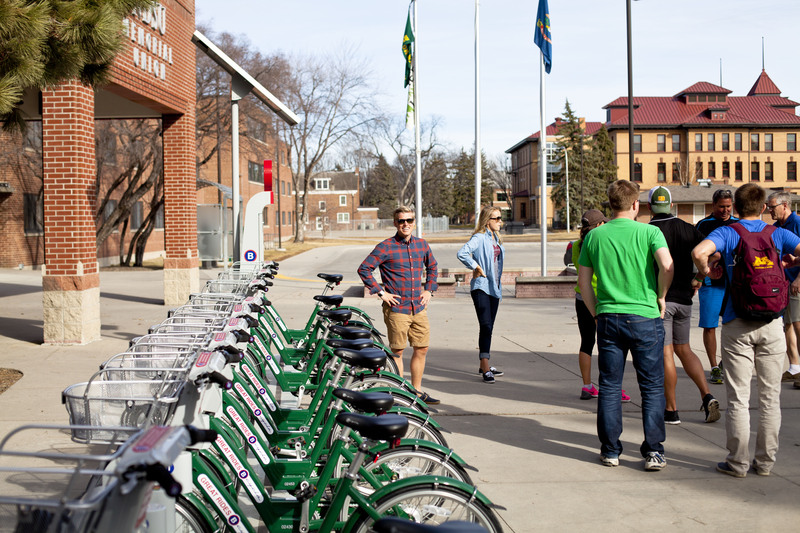 The group began to see that the newest Bike Share systems, that have begun to emerge across select cities in the United States as well as in Europe and Canada, would not only work in the city of Fargo but that it would likely thrive; producing countless numbers of direct and indirect benefits to Fargo citizens, students, and community guests alike. 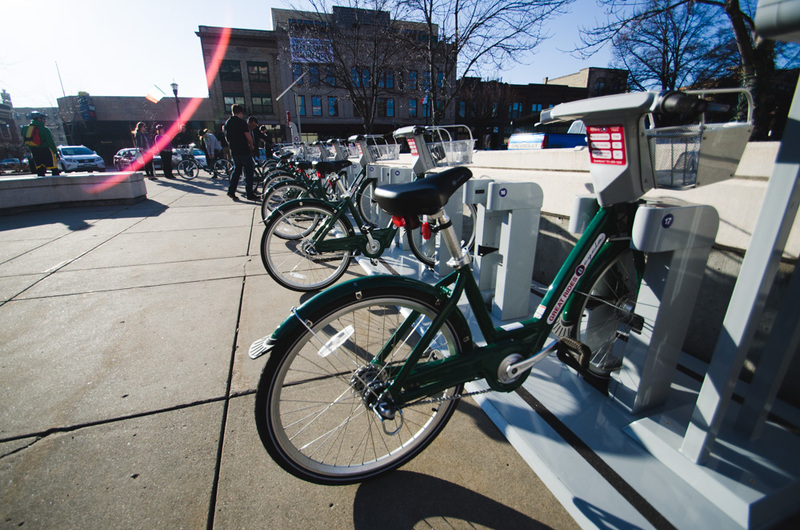 The current plan for the program includes initially launching the system in two of the most dense areas of the community (downtown Fargo and the NDSU campus) by installing a network of fully automated biking docks and high quality bicycles. The end result is an additional option of transportation that will further support the growth of the NDSU campus and downtown area of Fargo. The Fargo Bike Share group is excited to share their vision with you and is confident that this program will be a new hallmark component to our outstanding community. Provides an additional transportation option that coincides with Fargo’s MATBUS system. A number of key health benefits by encouraging students and citizens to regularly commute via public bicycles. Cost savings by reducing the need for an automobile and the associated costs of parking, vehicle insurance, gasoline, and additional maintenance costs. Fully automated system that allows users to find the nearest bike dock and check out a bike with a simple swipe of a student ID or membership card. The entire system comes equipped with smart phone applications and online usability to further enhance and ease the overall usage. Perfect component to the recently approved bike lanes connecting the NDSU campus and downtown area of Fargo. Take a B-Cycle out for a spin downtown today! Try out the fastest growing bikeshare system in the country today. Thanks to all the folks that pedaled and clicked Fargo to the head of the pack in the B-Cycle “who wants it more” national contest. The system, which lets users pay to use a bike to get to and from key transportation hubs, is coming to town today and Sunday for a test ride. It’s really the first step in Fargo getting the latest trend in public transportation, said City Commissioner Mike Williams. Bike-sharing is meant to supplement other transit systems and differs from a bike rental. Think of it as taking a pedal-powered taxi rather than renting a car at the airport, said Jason McDowell, projects and logistics manager for B-Cycle. Williams first saw B-Cycle in Madison, Wis., earlier this year and invited the company to give Fargo a spin. An online “Who wants it more?” poll on B-Cycle’s website pushed Fargo into the company’s focus. In a week, Fargo surpassed all other U.S. cities and took the No. 1 spot with more than 220,000 people voting. Moorhead is currently in fourth place with more than 100,000 votes. Bike-share programs are gaining traction in the U.S. after steady growth in Europe in recent years, Williams said. New York City announced Wednesday it will start a 10,000-bike system next summer. Fargo would begin much smaller, and there are still some major considerations, such as financing, before a plan could be put in motion, Williams said. He is hoping the demo will get nonprofits and businesses interested in the concept to step forward with sponsorship. B-Cycle, an off-shoot of Trek Bicycle Corporation in Waterloo, Wis., operates in about a dozen different communities of all sizes. The size of the fleet and location of the docking stations varies by individual needs within a community, McDowell said. Many cities have partnered with universities and large employers that need help moving many people around a relatively small area. And Fargo’s freezing temperatures aren’t expected to be a problem in the winter, McDowell said. B-Cycle did a test run of the system from December to February on a Colorado college campus, and the company worried students wouldn’t be interested. $5.00 Friday! – Every Friday! – Fresh Cut Flowers to Go!! “What we found is that they used the heck out of it because given the choice between walking for 20 minutes in wind chill or getting on a bike and zipping there in a few minutes, boy they sure liked the bike,” he said. Register online or purchase a 24-hour membership at a bike docking kiosk. Daily memberships start around $5, and yearly passes generally run about $60. Ride to the next docking station that is nearest your destination. Park bike in dock, where it is again locked and ready for next rider. FARGO – Fargo-Moorhead will close three miles of streets to motorized traffic from noon to 5 p.m. Sunday and open the road to bicyclists and pedestrians. For more information, visit www.fmstreetsalive.org. When: 10 a.m. to 5 p.m. today and 11 a.m. to 6 p.m. Sunday during Streets Alive! Info: The public can talk with B-Cycle representatives, take a quick ride and learn how to check out and re-dock bicycles. http://electwilliams.com/wp-content/uploads/sites/39/2018/04/web-logo-300x138.png 0 0 Mike Williams http://electwilliams.com/wp-content/uploads/sites/39/2018/04/web-logo-300x138.png Mike Williams2011-09-16 08:41:082011-09-16 08:41:08Take a B-Cycle out for a spin downtown today!